I don’t know the last time that walls, gates and drawbridges actually protected the city of Naples —maybe the early 1700s. Actually, the only drawbridge I know of in Naples is at the Maschio Angioino, and I suspect that the last time it was drawn was well before 1700. As for walls and gates—well, urban expansion and modern artillery have pretty much made museum pieces of all that. Of the 30 or so gates that have allowed passage into the city of Naples over the centuries, a couple still exist in a cosmetic sense; that is, they have been left in place (or moved and rebuilt to save the history), but you don’t really go from one place to another by passing through the gate. Only one gate still retains the feel of a city gate; that is, you walk from the outside through it into the old city, and you truly have the feeling that you are passing through a portal into something else. That is Porta San Gennaro, named for the patron saint of Naples. The “from somewhere else” is Piazza Cavour, the area of the National Archaeological Museum and the main street called via Foria north of the old wall; the “something else” is the oldest and crooked-&-narrowest part of the historic center of Naples, untouched by the urban renewal of the late 19th and early 20th centuries. If you turn left after you pass through Porta San Gennaro, you’ll be back out in the Naples of today a block or so from via Duomo; but if you go straight or turn right, you will get lost and never be heard from again. I have done that. 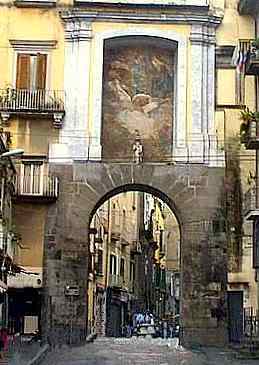 Porta San Gennaro is the oldest of all the gates of Naples, built by the Greeks as they put up the new city—Neapolis in about 450 BC. It was the opening in the north wall below the northwestern height of the city upon which stood the acropolis of the new city. It opened onto an area today known as the Vergini, an uneven volcanic area sculpted by eons of lava flows and rain water, terrain that has dictated even the layout of modern streets in the area. That area was essential to the Greeks, the Romans and the inhabitants of subsequent civilizations in Naples in that it provided a passage to burial sites. The area is honeycombed beneath the surface with ancient crypts and catacombs including the well-known San Gennaro catacombs. In the days before gates had names (except for “north”), this north gate was simply called the Tufa Gate and the road leading out to the burial sites was the Tufa Road, for the porous volcanic stone that has for millennia been the mainstay of Neapolitan masonry. Historically, Porta San Gennaro is said to have been the gate through which Belisarius passed to take the city for Justinian in the Gothic Wars in 536 AD. There is a famous bit of subterfuge involved in that one; Belisarius and his army by-passed most resistance by passing through the Bolla aqueduct and simply popping up at the city gate. (“Surprise!”). Much later, in 1443, the Aragonese used a similar trick to get by the north gate to take the city from the Angevins. The gate is not actually in its original location. Under viceroy Toledo in the 1500s, the Spanish did a lot of wall-and-gate moving, expanding the city walls wherever possible and moving gates into places along those walls; thus, in 1537, Porta San Gennaro was moved out about 50 yards from where it had stood. 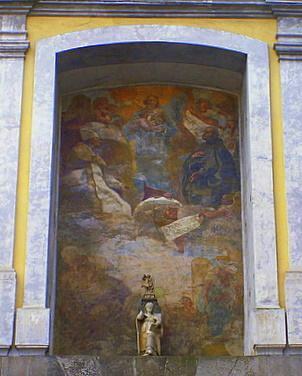 In 1656, as an ex voto during the infamous plague of that year, Mattia Preti painted a fresco (image, above) above the entrance showing San Gennaro, Santa Rosalia and St. Francis Xavier beseeching an end to the plague. The fresco has recently been restored.